Britain’s blues rock band King King kick off their Spring 2018 UK Tour including shows at the HRH Festival in Sheffield and the Rock & Blues Festival in Newport at the Worcester Huntingdon Hall on Saturday 14th April. Xander and the Peace Pirates, Steve Hill and Austin Gold support the Glasgow rockers on selected dates throughout April, May and June as listed below. King King released their fourth studio album Exile & Grace in October 2017 via Manhaton Records. The album features the band’s singles Broken, (She Don’t) Gimme No Lovin and Long Time Running which have been big hits on Planet Rock Radio in the UK. Exile & Grace is King King’s first album of new material since 2015’s multi-award winning Reaching For The Light. The new album follows King King’s across-the-board win of five awards at 2016’s British Blues Awards including Best Male Vocal (Alan Nimmo), Best Bass Player (Lindsay Coulson), Best Song (Rush Hour), Best Album (Reaching for the Light) and Best Songwriter. 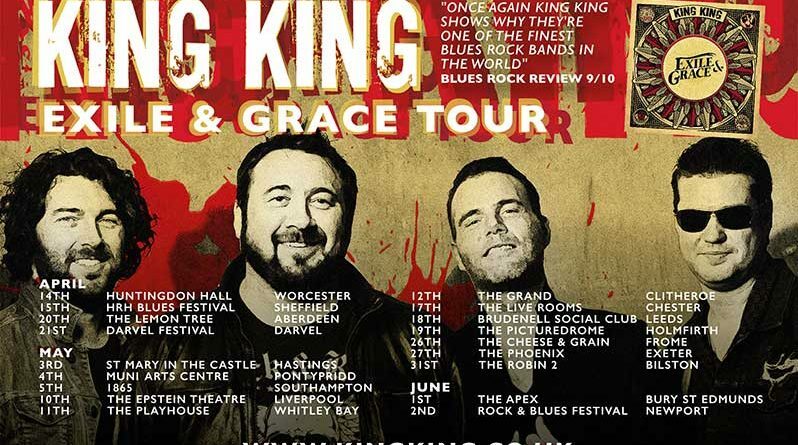 Further info about King King’s new album Exile & Grace and the Spring 2018 UK Tour, click here.